FMLA is the most important (and only) piece of federal law that protects certain qualifying workers from losing their jobs while they take parental leave in the U.S. on an unpaid basis. The National Partnership for Women and Families has provided an excellent guide with detailed answers to frequently asked questions about who qualifies for FMLA and which employers are covered. The infographic below by a Presigia, a HR software company explains that the law has protected over 50 million Americans since 1993 with up to 12 weeks of unpaid leave. The U.S. Department of Labor administers FMLA and provides forms that employees, healthcare providers and employers fill out to document and initiate the leave process. 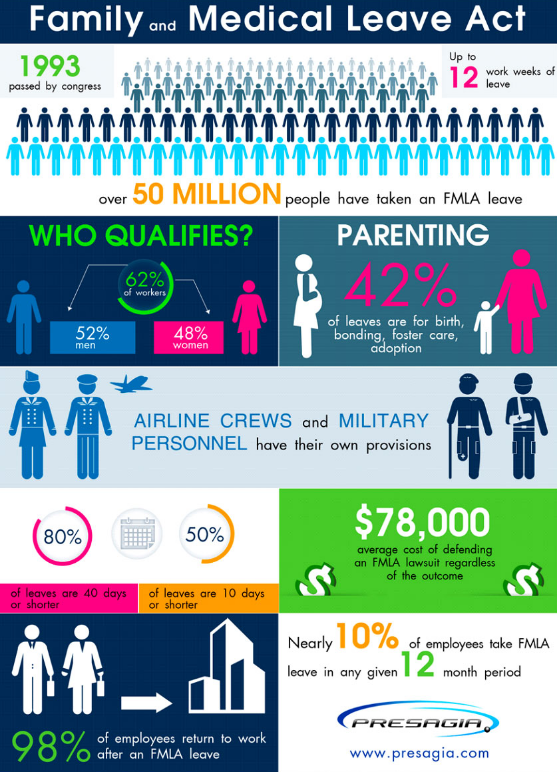 One important fact about using FMLA is that 78% of those who need it do not take leave because they cannot afford to take unpaid leave. In addition to FMLA, certain states expand the rights individual employees may have either in the form of more relaxed qualifying rules, more unpaid leave time, paid parental leave time (e.g. California, New Jersey and Rhode Island), or short-term (temporary) disability insurance programs that cover the inability to work during pregnancy (e.g California, Hawaii, New York, New Jersey and Rhode Island). See more about state maternity leave laws that may provide certain leave rights. See more about other federal laws that protect pregnant and breastfeeding women at work.